You can enjoy a delicious mango pomegranate mocktail topped with raspberries and thyme while working on your beauty goals at the same time. Yes, you read that correctly! 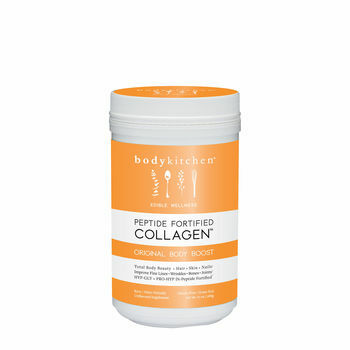 This recipe includes the Body Kitchen Original Body Boost Peptide-Fortified Collagen Powder, which supports total body beauty for hair, skin and nails that improves fine lines, wrinkles, bones and joints.† Treat yourself—you deserve it! First, remove the seeds from the pomegranate and set aside for the garnish later. Blend the diced mango, honey and water until it becomes a puree. In a separate large pitcher, combine the pomegranate juice and Original Body Boost. Add puree to the large pitcher (full of pomegranate juice and Original Body Boost) and stir vigorously until the powder dissolves. To complete, add ice, pour into a glass and garnish with the pomegranate seeds, raspberries and sprig of thyme. Enjoy! NUTRITION INFORMATION (per serving): 240 calories, 0 g fat, 55 g carbohydrates, 1 g fiber, 6 g protein, 60 mg sodium, 20% daily Vitamin A, 15% daily Vitamin C, 4% daily Calcium, 2% daily Iron.